Motor Home Specialist is the #1 Volume Selling Motor Home Dealership in the World. Over $165 Million Dollars to Choose From. New RVs from $17,999 Travel Trailers to Over $2,000,000 Bus Conversions and Every Type & Price-Point in-between. No Games. No Gimmicks. Upfront Pricing on Every Make and Every Model. Minimum 25% Off M.S.R.P. on All New Motor Homes. 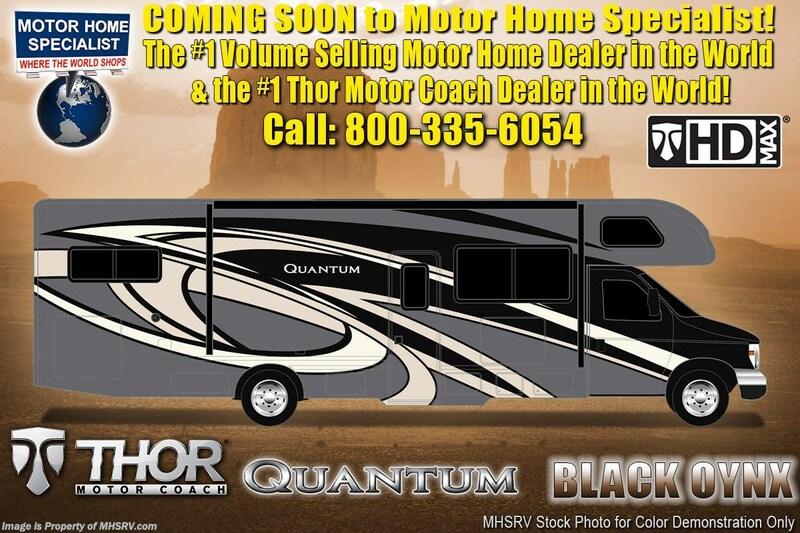 Visit MHSRV.com or Call 800-335-6054.<br />1-2-19 <a href="http://www.mhsrv.com/thor-motor-coach/"><img src="http://www.mhsrv.com/images/sold-thor.jpg" width="383" height="141" border="0"></a> MSRP $141,490. 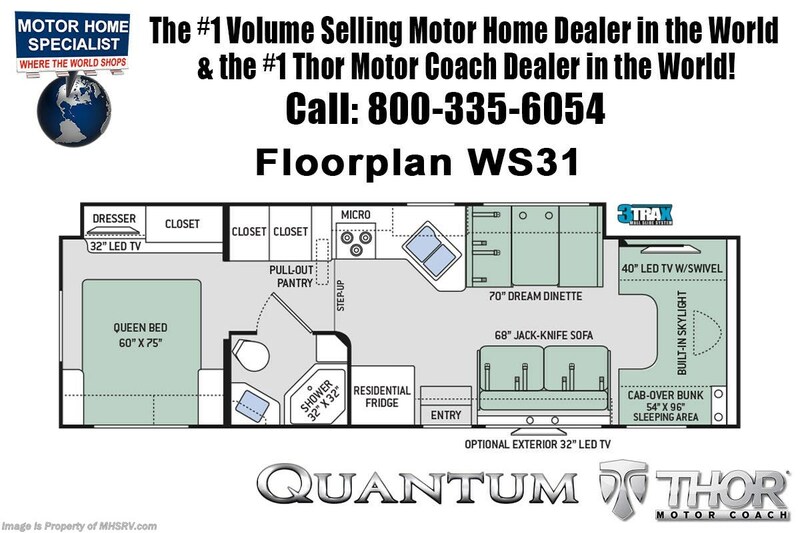 New 2019 Thor Motor Coach Quantum Class C RV Model WS31 is approximately 32 feet 2 inches in length with a driver’s side full-wall slide, Ford E-450 chassis and a Ford Triton V-10 engine. New features for 2019 include new style cabinet doors and hardware, new style fascia, bedroom USB charging station and 12V outlet for CPAP machine, power bath vent with wall switch, robe hooks inside bath, updated interior decor options, update exterior colors, solar panel ready with solar charge controller, 360 siphon RV holding tank vent cap, 1" fresh water tank drain and much more. Options include the Platinum & Diamond packages which features roller shades, solid surface kitchen countertop, exterior shower, backup camera with monitor, upgraded wheel liners, black frameless windows, convection stainless steel microwave, residential refrigerator, 1,800 watt house inverter, automatic generator start and the Rapid Camp remote system. Additional options include the beautiful full body paint exterior, single child safety tether, attic fan, (2) 11,000 BTU A/Cs, cab over safety net, power driver&apos;s seat and cockpit carpet mat. The Quantum Class C RV has an incredible list of standard features including beautiful hardwood cabinets, a cabover loft with skylight (N/A with cabover entertainment center), dash applique, power windows and locks, power patio awning with integrated LED lighting, roof ladder, in-dash media center, Onan generator, cab A/C, battery disconnect switch and much more. For more complete details on this unit and our entire inventory including brochures, window sticker, videos, photos, reviews & testimonials as well as additional information about Motor Home Specialist and our manufacturers please visit us at MHSRV.com or call 800-335-6054. At Motor Home Specialist, we DO NOT charge any prep or orientation fees like you will find at other dealerships. All sale prices include a 200-point inspection, interior & exterior wash, detail service and a fully automated high-pressure rain booth test and coach wash that is a standout service unlike that of any other in the industry. You will also receive a thorough coach orientation with an MHSRV technician, an RV Starter&apos;s kit, a night stay in our delivery park featuring landscaped and covered pads with full hook-ups and much more! Read Thousands upon Thousands of 5-Star Reviews at MHSRV.com and See What They Had to Say About Their Experience at Motor Home Specialist. WHY PAY MORE?... WHY SETTLE FOR LESS?